The "h" in Shady's 90-second assault is for "hate"
Eminem won an Oscar way back in 2003, but he’s here to show he’s “still a grouch.” Slim Shady bares his cranky side on “Symphony in H,” a 90-second track from early Em champion DJ Tony Touch’s upcoming mixtape, Piecemaker 3: The Return of the 50 MCs. That long-ago Academy Awards win isn’t the only reference here that feels dated: “Hell yeah I’d nail J. Lo / To a railroad,” the rapper fumes at one point, and June 8, a specific date actually mentioned here, has already passed. Still, it’s a treat to hear Eminem angry again — comparing himself to Beethoven, he calls the track “a sympony of hate” — and the stomping, martial backing stays out of Marshall Mathers’ way. As for hopes the song might appear on an upcoming album, previously promised for sometime after Memorial Day (June 8 would’ve been nice! 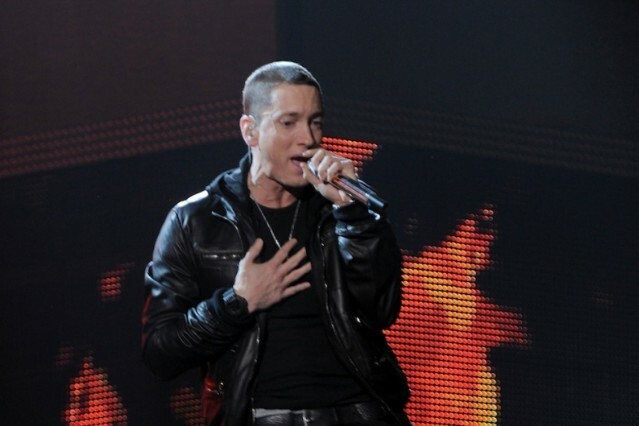 ), Eminem’s manager, Paul Rosenberg, tweeted last night: “You guys are terrible. It’s from 50 MC’s. if you knew anything you would know that those mixtapes are VERSES from 50 diff rappers. SMH.” So, that’s a no, then?